House Sparrows are quite vocal birds. 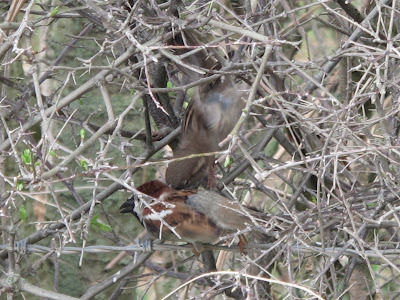 In spring, a house sparrow colony is hard to miss, with males advertising their chosen nest sites to potential males by chirping and posturing, but mainly by their peculiar communal courtship. Communal courtships start when a fertile female not guarded by her mate flies by an unmated male, the male then will pursue her while chirping and displaying persistently soliciting copulation. More males usually join in the female chase and courtship in a cacophony of strident chirps. The female is far from passive to the male's attentions, and often lunges and pecks at the males (photo below), which seem quite unfazed. Forced copulations - and also accepted copulations - occur during these communal courtship displays. 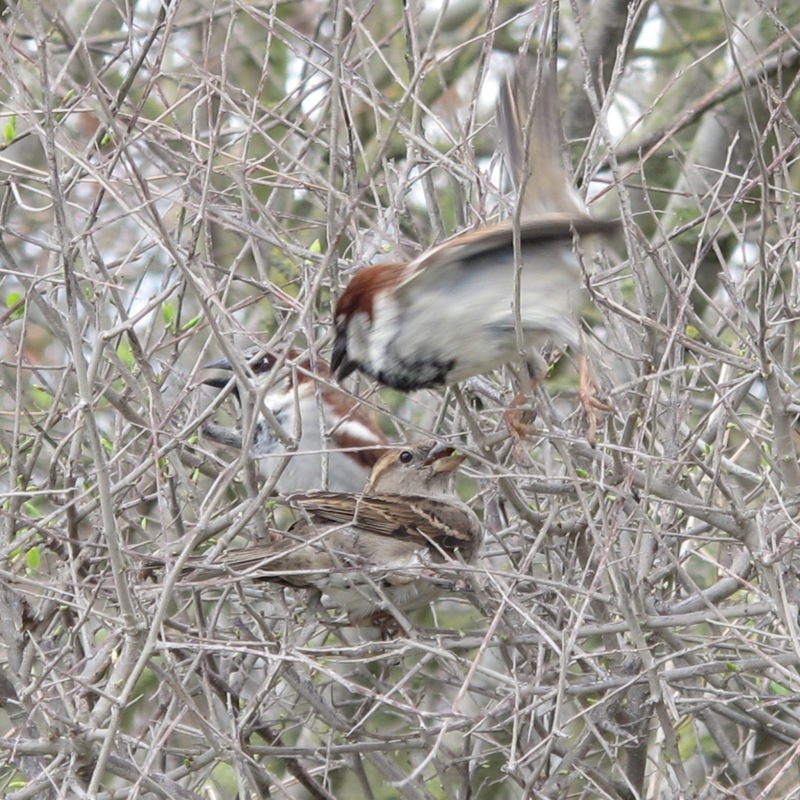 Male sparrows with large black chest badges are more dominant in the sparrow colony. They guard their mates during the fertile period - around the period when egg-laying is taking place - and copulate with her frequently. But males with large, in addition, join communal courtships more often than males with small bibs, so these dominant males may achieve paternity both though their mate's offspring, and through extra-pair copulations. 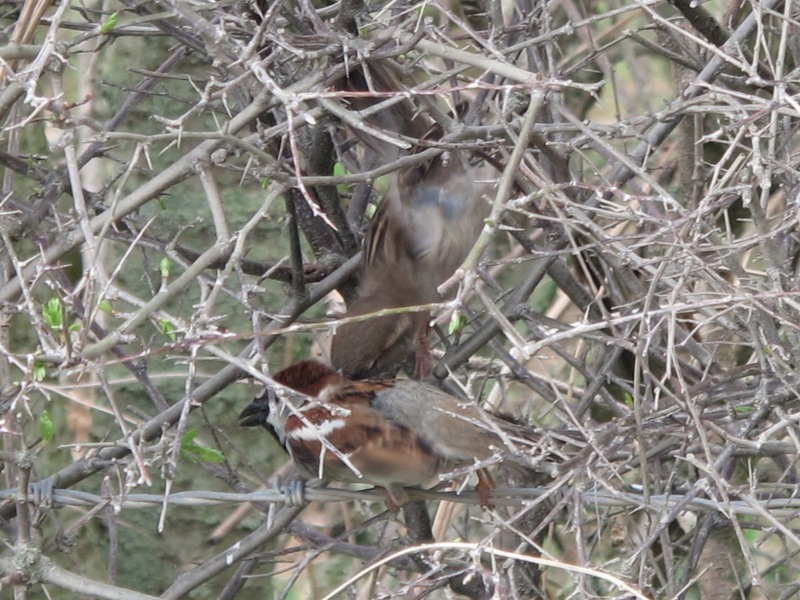 Today, in a local farm, I managed to get these shots of communal courtship in House Sparrows. Two or three males were harassing a female, and she managed to peck one of the males (below). I know the noise they make outside my window, I wasn't aware of the courtship ritual though.